Hi guys long time since last ‘blog’ forget I have this facility, always moaning at kids about too much time spent on social media and forget I should do the same. Anyway what’s going on in nursery? first thing is we have developed a new arm to the business “Pots Direct ‘in the past we have played around with the odd shipment but are now focusing on extended ranges and styles coming into the country on a regular basis. 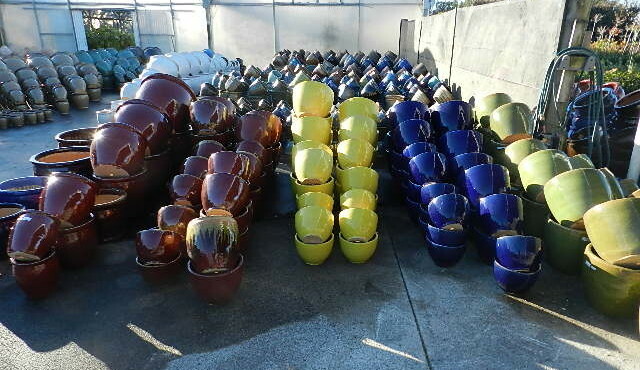 All the pots are sourced directly from the factories in Vietnam and shipped in bulk to us, our next shipment is over 60 ton and expected mid to late August. We are also launching a new range of veg seedlings, our Asian/Middle Eastern is really exciting, its a very authentic range including Amarantha, Red noodle beans, Edaname, Edible gourds, Bitter Melon, Shungiku, Egg plant Tong Long and Thai Purple plus many more. We also have the 5 hottest chilli’s I the world ‘Caroline Reaper, Naga Viper, 7 Pot Douglah, Gringo Killer, and Habanero plus our standard range. There are a few new tomato varieties, baby cos, new giant and heirloom peppers, the list just goes on and on, all available from late September onwards. We will run our typical press ads as we get into spring to help let you know when things are available, talk again soon.